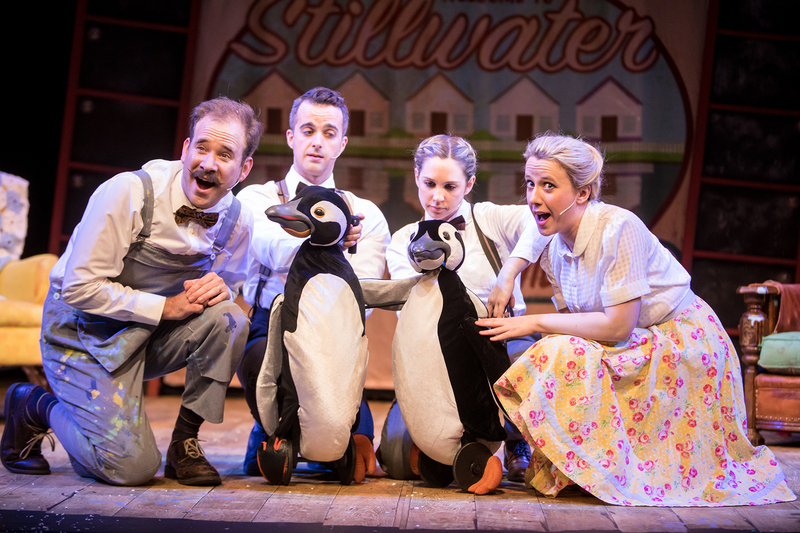 Susanna Jennings, Monica Nash, Richard Holt and Christopher Finn in the Pins and Needles-Children’s Theatre Company co-production of Mr. Popper’s Penguins. Photo by Dan Norman. A sweet and sentimental tale of realizing one’s dreams as well as the joy of raising penguins is currently gracing the stage at Children’s Theatre. Mr. Popper’s Penguins – based on the classic children’s tale by Richard and Florence Atwater – is presented by Pins and Needles and features music by composer Luke Bateman and lyrics by Richy Hughes. This production especially hits home since, like Mrs. Popper, I, too, have a spouse who watches every documentary on polar explorers and has pined to travel to Antarctica for decades. This show has something for both young and old. Director Emma Earle oversees a show where the penguins are the prime attraction. Mr. Potter has his dreams and his wife has her disappointments in Mr. Potter, and they live very separate and somewhat lonely lives…until Popper’s fan letter to Artic Explorer Admiral Drake brings about the surprise delivery of a penguin to their household. Although the arrival causes disruption to the household, both Poppers become very fond of the new family member – named Captain Cook – and take on his parenting duties. Soon, one penguin becomes a couple and then the couple expands their own family with eight baby penguins. The Poppers grow closer together as the care of the penguins not only takes over their hearts, but also their house, which they choose not to heat to provide a habitat for the penguins. (Penguins are not for everyone, although Minnesotans might manage.) Ultimately, the Poppers turn their family into a show business phenomenon so they can afford to feed and care for their little ones. Richard Holt, Christopher Finn, Susanna Jennings, and Monica Nash in Mr. Popper’s Penguins. Photo by Dan Norman. The show starts out low-key, reflecting the Popper’s lives, and steadily picks up steam with the different dramas resulting from the penguins’ activities. 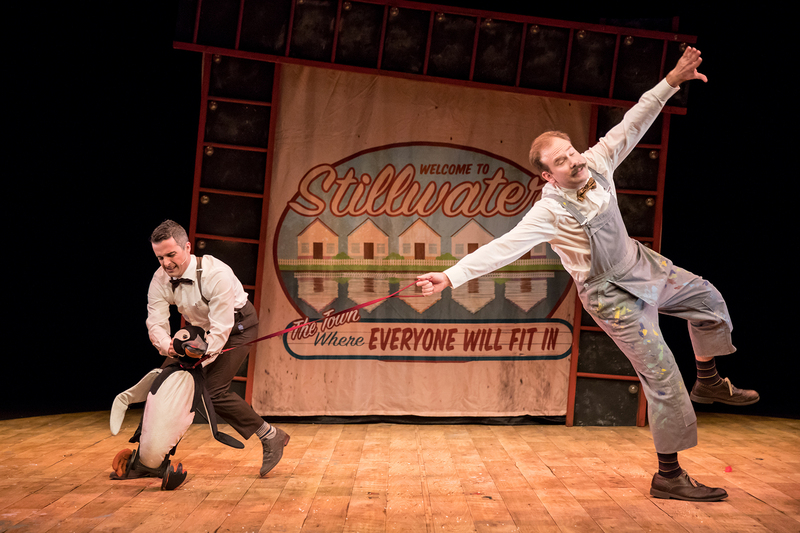 The minor unrest with the child audience melted away as the story progressed, and the younger audiences became absolutely enthralled during the musical’s second half. The show’s talented cast includes Richard Holt as an understated but noble Mr. Popper. The audience can’t help but root for him when he must both face loss and yet manages to finally realize many of his dreams. Monica Nash nicely plays a rules-driven Mrs. Potter who nevertheless abandons the rules as she becomes the penguins’ mother and joins in her husband’s dreams for adventure. Christopher Finn plays various roles, including penguin puppeteer, and stands out in his performance as the fast-talking promoter of the Popper penguin show. The ensemble is rounded out by Susanna Jennings in various roles, including her own turn as penguin puppeteer, and Oliver Byum as Admiral Drake, who keep things flowing smoothly. At the end of the show, the cast had the audience joining in with a song and dance. Even without the group sing-a-long, however, one cannot help but leave the show with a song in your heart. Penguins. Photo by Dan Norman. Mr. Popper’s Penguins plays at the Children’s Theatre Company in Minneapolis, MN through February 24, 2019.